Recent release “My Miracle Journey” from Page Publishing author Mohammed Bajeri is a true coming of age story as the real-life twelve-year-old protagonist struggles with the implications of having dyslexia and how to make his dream of flying come true regardless. Mohammed Bajeri, celebrated as the ‘Miracle Kid’ for his extraordinary accomplishments which were supposed to be made impossible by a diagnosed learning disability, has completed his new book, “My Miracle Journey”: his personal account of his battle with dyslexia, the toll it took on him emotionally, the support network that assembled to help him succeed, and his momentous success in beating the odds. 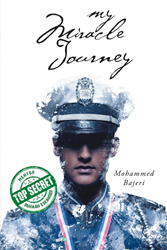 Published by New York City-based Page Publishing, Mohammed Bajeri’s sensational tale is one of insecurity, isolation, and seemingly insurmountable obstacles followed by an acknowledgement of support, a revelation, and a journey across three continents to the United States where the young hero finally realizes his dream of becoming a pilot. Readers who wish to experience this inspiring work can purchase “Miracle Kid” at bookstores everywhere, or online at the Apple iTunes store, Amazon, Google Play or Barnes and Noble.